Still a fun read, though. The Year of Living Biblically: One Man's Humble Quest to Follow the Bible as Literally as Possible by A. J. Jacobs. S&S, 2007, 388 pages. 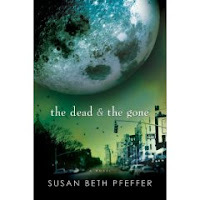 The Dead and the Gone by Susan Beth Pfeffer. Harcourt, 2008, 320 pages. Diary of a Wimpy Kid by Jeff Kinney. Amulet/Abrams, 2007, 217 pages. Diary of a Wimpy Kid: Rodrick Rules. Amulet/Abrams, 2008, 224 pages. Catch-22 by Joseph Heller. S&S, 1961, 443 pages. Lots of bloggers were out and about, including Fuse, Chicken Spaghetti, Jen Robinson, and Liz B. I also got a goodly amount of reading done (thank you, time alone with no dependents! ), so new haiku will come soon. Off tomorrow avec bebes for NCTE in NYC. Fortunately, said bebes are spending the weekend at Grandma and Grandpa's, while I bustle about the city gleefully free from small creatures climbing all over me. If I'm lucky, I will get to see Fuse and Alison, too. But -- poop on a stick! -- the labor movement has decided that I will not get to see The Little Mermaid on Broadway (or, as she is known in my house, "Ariel the Little Mermaid," with nary a pronoun to be found). At least Mary Poppins is still on the docket. Good Masters! Sweet Ladies! Voices from a Medieval Village by Laura Amy Schlitz. Candlewick, 2007, 85 pages. The Absolutely True Diary of a Part-time Indian by Sherman Alexie. Little Brown, 2007, 229 pages. Guyaholic by Carolyn Mackler. Candlewick, 2007, 192 pages. But it's so subtle . . . The Lion, the Witch, and the Wardrobe by C. S. Lewis. Geoffrey Bles, 1950, 186 pages. #23 on The LIST. Listened to on a Playaway device (read by Michael York, who, sadly, is now forever associated with an unfortunate cup of coffee). Run by Ann Patchett. Harper, 2007, 295 pages.